Military families face unique challenges in building and maintaining a great credit score. Regular moves, job changes and irregular income for military spouses, and international deployments all have the potential to cause havoc in your personal finances. But military families also have benefits and access to unique accounts that offer an advantage over plain old civilians. Ready to find out more? Follow along to learn useful tips for military families to boost their credit. The first step to building or fixing your credit score is to avoid bad debt. Bad debt are debts that only cost you money in interest and give little in return. The biggest offenders are credit card debt and payday loans, both of which charge very high interest rates and don’t give you anything in return aside from what is essentially a short-term loan. Many personal finance experts argue that all debt is bad, but some debt can be beneficial, like a mortgage to buy a home or student loans in pursuit of a degree with great job prospects. These types of loans charge lower interest rates and give you something in return. Further, these types of installment loans, when paid on time each month, can help increase your credit score over time. As long as you don’t miss payments or pay late, there is no shame in a mortgage and it can help your credit score. Carrying any credit card balance, however, lowers your score. The best balance for your credit score is zero. Not only is credit card debt expensive, it lowers your credit score. If you can avoid credit card and payday loan debt from the start, you are setting yourself up for success. There is a special regulation just for deployed military members that allows you to avoid all credit card annual fees while overseas. Many banks and card issuers offer additional benefits to military members and their families, particularly if the military member is called up for service and sent on a tour of duty outside the United States. One example is the VA mortgage loan, backed by a program from the Department of Veterans Affairs. 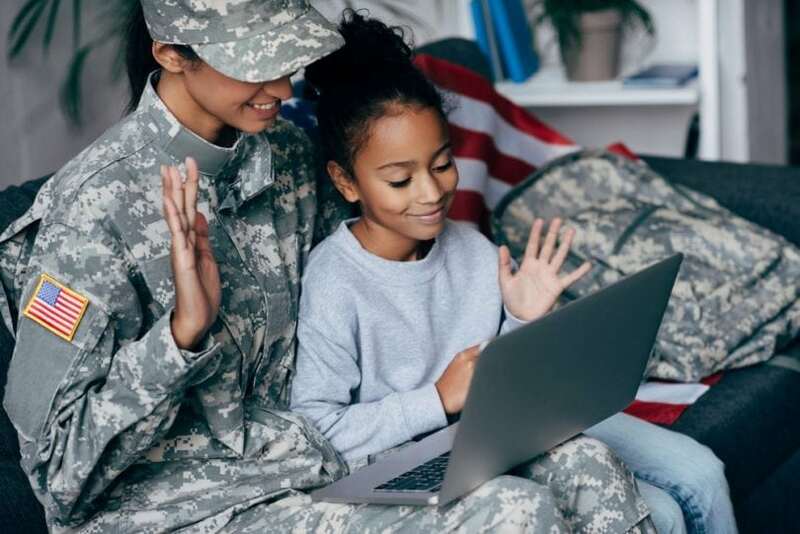 These are government-backed loans that help military families qualify for a loan with lower interest rates, and sometimes lower credit scores, than a traditional mortgage loan. Familiarize yourself with the Servicemembers Civil Relief Act (SCRA), which restricts terms, fees, and interest rates for military members and families. Protections extend to home rentals, mortgages, auto loans, credit cards, and other financial tools, according to Jason Steele writing for The Points Guy. While some of these benefits don’t directly help your credit score, they do put you in a better financial position and empower you to take steps to raise your credit score, like keeping debt balances low. If you can avoid fees and other financial costs, that is money that stays in your bank account giving you more flexibility and more options to manage your credit. Some banks and credit unions offer specific accounts for military members and their families. For example, USAA is a well known financial institution designed specifically for military members. In fact, to join USAA, you must be an active military member, veteran, or child of a veteran. PenFed (Pentagon Federal) Credit Union is another institution with specific benefits for the military. Keep in mind that you don’t have to live near a branch to take advantage of many of these banks and credit unions. I joined PenFed Credit Union while I lived in Portland even though it is based in the Washington, DC area for my mortgage, which offered better terms than any local lender I spoke with. PenFed offers a mortgage loan called the 15/15 ARM, which is an adjustable rate mortgage that doesn’t adjust until after 15 years. This gives you a lower interest rate, and as odds are you will be moving in the next few years, products like these can help you save big on borrowing costs. Roughly one in four families qualifies for USAA membership, and by extension other financial institutions just for the military. That means there are big resources available to help you succeed with your personal finances. America supports its service members, and there are some great organizations that offer free resources for military families to better manage their finances. If you live on or near a large base, you likely have access to a wide range of options to get financial help, including with your credit. These organizations all offer programs that can help you fix up your finances, with various classes, publications, and assistance options. In many cases, they will help both active duty and veteran families, including widows and widowers. Don’t forget that the Credit Solution Program is here to help as well! Credit scores can be ruined in an instant, but take years to build and fix. Take advantage of the resources at your disposal to turn that credit score around. If you do, it should save you money and stress as you work toward a stable and successful financial future.